From a historical context, it has nothing to do with the path of conquest and expansion European immigrants would ave across North America. At the time the first Thanksgiving took place, the Pigrims were on the verge of dying off. When the Wampanoag approached them, the Pilgrims were dying off on their own. They could’ve just sat back and watched the settlers die off but they chose not to. They chose to act. They chose to save Plymouth. Many New England Native Americans and other groups against the national holiday on the grounds of what happened to the Indigenous Tribes of North America over the next 250 years have no historical basis for their objection to the holiday. If anything, America owes the Wampanoag tribe its thanks as without them, there would have been no Thanksgiving, no Boston Tea Party and no American Revolution. It’s true that after a war, what happened is initially written by the winners but in time, the full truth will be made known. If I were a different person I would chose this moment to point out the fact what happened to Africans stolen from their homes and sold into slavery over the course of 400 years on almost every continent is a whole lot worse. I will say that the irony with many hate groups is thanks to modern technology and geneology records, we now know very few people who came to Massachusetts on the Mayflower ever left New England. Most of them died off during that first winter, after all. Due to superstitions and relgious beliefs it is also unlikely the Pilgrims married and had families with the Wampanoag and vice versa. They learned from each other and helped each other. The Wampanoag knew the land and knew how to farm on what is still considered today one of the most difficult places to grow crops on. The Pilgrims shared their technology with the Wampanoag as well as English with the help of Squanto, a Native American who lived among Europeans in his younger days. What happened after that period cannot be blamed on that first contact between the two factions. The blame should be placed on misunderstandings and assumptions made by both sides over the years. The Windtalkers are the epitome of what happens when both sides work together for a common cause. For those who don’t know, the Windtalkers were Native Americans who fought in World War II and transmitted coded messages from the battlefield to field commanders in the Pacific Theater in their native tongue. A source of pride for the Windtalkers is they still stand as the only people whose radio messages were never decoded by the enemy in American history during war. There is a very good reason for this. Until about 70 years earlier, few Native American tribes had a written language. It was only oral and is still mainly learned this way today. So in closing, Thanksgivinng is a time of understanding. While yes I believe everyone should know about what happened to the Native Americans, on the other hand not everyone views Thanksgiving as a national holiday. The American Public and Native Americans have a shared history that isn’t exactly pretty. Just like it doesn’t make any sense for African Americans today to demand an apology from their white counterparts for things that happened over the last 400 years, it’s wholly unrealistic to expect the every0ne to do the same for Native Americans. Even if I wasn’t a black man I’d still say that. To those who will forgo this holiday objectively, I reccommend you use this time as an opportunity to educate someone on what Thanksgiving means to you and explain why what happened should never be forgotten. As the saying goes, those who forget their history are doomed to repeat it. The small green notebook will contain the names and dates of instances in which someone says one of the following phrases: “I owe you” (or similar variation), “I’ll make it up to you” (Or similar variation) or “I’m in your debt” (or similar variation). To clarify, I’m not talking about money (though it can be, lol) but favors. Small tasks, oddjobs, stuff like that. Lately I’ve been collecting ALOT of IOUs from a few folks both at work and elsewhere. I don’t want to forget the who and when so that when I decide to start “cashing in” those IOUs they’ll know to be ready to “pay up”. By the way I don’t loan money since I rarely carry cash. The reverse also holds true and those I’ve had a personal, non-financial debt with knows when I return the favor I do it with interest every time. It’s what I do. To go into a bit more detail, the IOU only gets logged if it’s mutually agreed upon. I’m talking about IOUs I get from folks. I will log it the name of the person I got the IOU from as well as the date so I don’t forget. As I mentioned above the reverse also holds true and when certain specific conditions are met, my IOU with someone can be transferred to someone else. I say that because this happened earlier this week with an old and new friend of mine. No, I won’t get into any further detail nor will I tell you what the conditions were. in that particular case. It’s a secret! I think it’s needless to say the art of cashing in an IOU on someone is a like work of art. Having said that, it’s courteous to let the person you’re going to cash in on know in advance so they can do accomodate your needs. I make it easy for folks who cash in on me: I give ’em Coupons. That’s just what I’m willing to make public. As for the ones that can be reused there is no experation date. None of my coupons expire, actually. It’s a topic ALL schools think about. Some folks might find it hard to believe but even before Columbine, it’s something schools have been trying to minimize for decades. I think it would be fair to say the explosion of school violence in America during the late 1990s was the tipping point. I know simplifying the chain of events from a troubled young person with access to weapons who is bullied to their decision to respond with violence is often characterized a certain way by the media but it’s never that “simple”. As I’ve said in past blogs and YouTube videos I was bullied as a kid and teenager. I’ve been bullied as an adult, yes but I want to keep the focus on how bullying affects children and teens. First, let me back up a second and explain two things. The first is unlike my past blogs and videos on the subject nothing has recently happened that led me to talk about this now. Second, I think it’s an important topic for those who either don’t have experience with bullying, are in the Education profession, have children or a combination of all three. First, I want to say something to those who have little to no experience actually working with children in a school: Speaking for all of the school communities I’ve been a part of over the last 10 years (including the schools I worked in when I was in City Year), I don’t think I’m wrong when I say ALL schools take reports of bullying either at school, on the bus or on school sponsored field trips very seriously. There seems to be a growing belief by many outside education–and even some inside the education industry–that schools today aren’t doing enough to address “the problem”. At the same time, there is another camp that believes gun violence is so deeply engrained in American culture it’s impossible to really be free of bullying and/or violence. Both viewpoints are wrong and I’ll tell you why. First, kids are human. They’re still trying to figure out their emotions let alone everything else. As educators, caregivers and beyond it is our duty to help them understand what they’re feeling, why they feel the way they do and help them express their feelings in a way and place that is healthy and safe for them and those around them. The key is actually making the time to do it. This is something that is often talked about at the Mission Hill School where I work. If you’re going to do something, you need to make the time to see it through. The first step is making the time to sit down and have those difficult conversations, preferably long before an incident occurs to necessitate the conversation. As for the second viewpoint, the conversation needs to shift from impossible to what is possible. For starters, how many families, classrooms and/or school communities are talking about it? It’s not enough to say “this is not okay”. We also need to say why we feel it’s unacceptible for a Second Grader to be playing Call of Duty: Black Ops II, Call of Duty Ghosts and Grand Theft Auto V along with why these and other similar games have the Mature rating. For those who don’t know, that’s the equivalent of the R-rating for movies. One feature added a few years ago to The Entetainment Software Rating Board’s website–or ESRB for short–is the ability to look up games and see why exactly every game gets their particular rating. I’ve linked you to the ratings for those three games in particular not just because they were all released in the last few weeks and are very popular but because of the depictions of violence in all three games most families would not knowingly expose their children to had they known in advance. Most families really don’t know what is in some of the games they buy for their children and as someone who’s bought video games over the last 14 years, you won’t get much help from the box or the video game industry (other than the usual jargon about their games not being marketed to younger audiences) when it comes to the question “is this game ok for my child?” and by ok parents mean “is there anything in this game I don’t want my child to be exposed to?” To their credit, the ESRB’s website goes above and beyond in explaining what exactly is in many popular games. It’s really up to families to be vigilant about what kinds of things they want their children to be exposed to. Having answered both extremes in detail and within reason, I’ll sidestep the various causes of bullying for now and instead talk about how the Mission Hill School addresses a few instances of bullying. As for why I’m sidestepping the causes right now, I want to give that a separate conversation because of the numberous factors that may or may not be involved. The reason I’ve chosen to talk about how the Mission Hill School addresses bullying is because I feel it’s something that can be implemented not just at any other school but in at home, too. First, the two parties meet with an adult who facilitates the conversation. They discuss what happened, and what steps can be taken to either avoid or stop the undesired behavior. Next, the class community(ies) the students belong to hold a meeting to discuss what happened mediated by an adult, usually a classroom teacher. This isn’t a time to put the offender’s feet over the fire. It’s a time to talk about why what happened had happened and how the offender’s actions hurt the community. Finally, the community help the offender come up with steps to avoid landing in the same kind of trouble again. If they are unable to come up with an action plan at that first meeting they can revisit the conversation at a later time. Involving the class community it not only important but it’s also powerful. It shows both the offender and the offended they are valued by their peers as members of the class and school community. It also shows the community they have a say in how both parties fit in the community. Kids are not adults. They can’t process things the same way (most) adults can. That’s why it is out duty as educators and families to help the understand the world around them. When there is reported undsired contact between two students, the offended student needs to tell the offending student about the contact and how it made them feel. Even if it was an accident (and in most cases no harm was intended) it’s important both of them understand that. This speaks to the belief at Mission Hill that when two sides have a dispute–student, adult or a combination of the two–they talk about it until it’s been a resolved in a way that is satisfying for both sides. usually a hug, handshake or high-five. Believe it or not this IS possible. I’ve seen it done with 3-year olds. The key is making the time to do it and making it a part of your daily routine. Two of the main reasons disputes happen are a lack of a willingness to try to understand one another and a lack of a willingness to try make the time to understand one another. If everyone took the time to try one they will automatically get the other. As a whole, the Mission Hill School has two rules: Be Kind and Work Hard. Generally speaking, everything you can think of falls in one of those two categories. Anyone can be kind and anyone can work hard. I couldn’t find a video clip of the song they did for the Mayor-Elect but the chorus is Marty Walsh for Boston. When it makes its way to You Tube I will edit it in here. Going back to the second video, turns out the majority of Boston agreed. Getting serenaded by the Dropkick Murphys certainly can’t hurt. either! 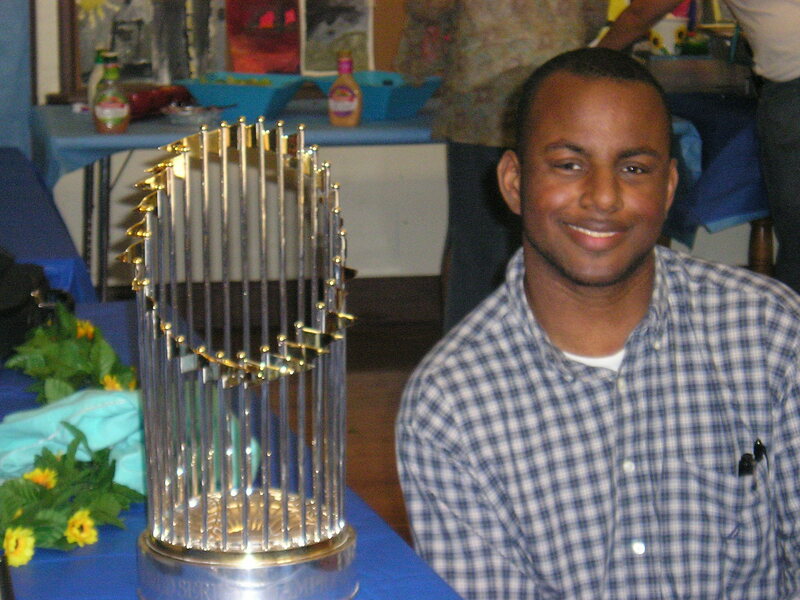 Me pictured with the Boston Red Sox 2007 World Series Trophy. 6 months ago I wrote this blog about the Boston Marathon Bombing the day after it happened. In the days immediately after the events of that day people and organizations from all over the world sent their love. From a Red Sox fan’s perspective, this tops ’em all. You see, I feel the need to explain something for those who either do not hail from a sports town/city or a Baseball town/city. The mutual love and respect between the Red Sox, Celtics, Bruins, Patriots and their respective fans has the power to unite an entire city in ways not even our elected officials have been able to figure out. Yes, everyone in attendance at Fenway Park joined in to sing the Star Spangled Banner. As David Ortiz said that day, this is our <Bleep> City (He changed the swear word when he spoke after last night’s game to “BIG”. It’s interesting to note MLB and the FCC looked the other way when he swore on national tv!). 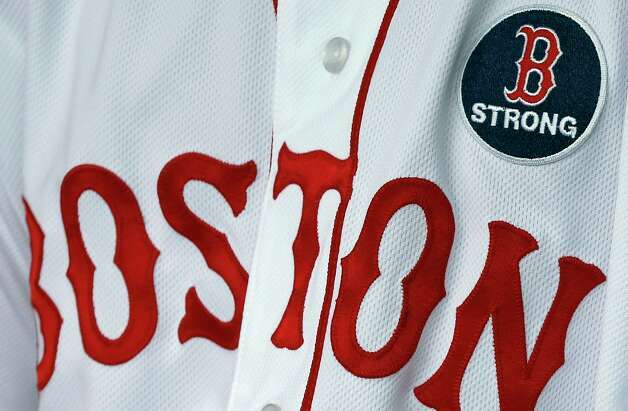 We are Boston and we are Strong. We are Boston Strong. The 24 boat rally begins near Fenway Park at the intersection of Boylston and Ipswich. From there it travels down Boylston, takes a left on Tremont, a left on Cambridge, a right on Blossom and will finish in the Charles River.